One morning in April 1924, The Honourable Daisy Dalrymple Fletcher finds herself in a most unenviable position. Despite her best attempts to elude the inevitable, she must face her darkest fears and with all strength and courage she can muster, must confront the one person she has tried hardest to avoid - the dentist. But upon arriving for her appointment, she finds the waiting room deserted and adjoining examination room locked with no hint of either Dr. Talmadge or his nurse. 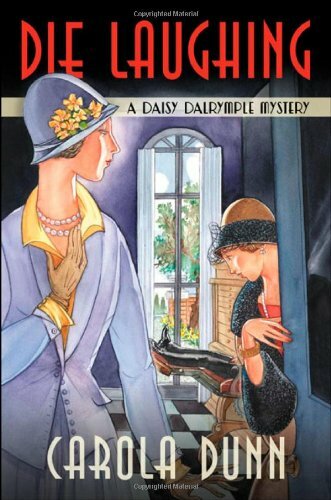 Thinking to leave quietly, Daisy's retreat is halted by the return of the nurse and, with the help of Mrs. Talmadge, the two begin searching for the inexplicably absent doctor. Exhausting all other possibilities, they resort to looking once again in the surgery where they find him stilling in his dentist's chair with the nitrous mask strapped to his face, the tank of nitrous turned on full, a smile on his face and stone, cold dead. While the circumstances of his death are out of the ordinary, there's no reason to suspect that it was anything other than a tragic, if inevitable, accident of a careless dope fiend. At least to everyone but Daisy herself. Sure that there is something more than happenstance and an accident involved in the dentist's untimely death, Daisy is determined to uncover the truth behind a case of what she is certain is murder most foul. "Replete with well-drawn characters, snappy dialogue and interesting plot twists...Easily the best entry in a charming series." "Daisy and her husband spring into action, surrounded by historical armaments, secret rooms, hidden treasure, and family secrets. For fans of British cozies and Dorothy Sayer's novels, this is a very inviting situation." "Styx and Stones is a swift, deeply enjoyable read. While Dunn's influences are many, she ultimately makes this territory her own." "Reading like an Agatha Christie thriller, Rattle His Bones is a charming look at life after the first World War." "Dunn captures the melting pot of Prohibition-era New York with humorous characterizations and a vivid sense of place, and with careful plotting lays out an enjoyable tale of adventure."